sugar, a good thing gone bad? Put the spoon (or shovel) down and back away from the sugar bowl. We all have our sugar moments (days, weeks, months) and although sugar is not innately evil, chronic over-indulgence can seriously impact health and wellbeing. Obesity, diabetes, mood swings, fatigue, sleeplessness, addictive behavior, anxiety, intestinal distress, depression, and a host of other diseases are all being linked to excessive sugar intake. Yikes, bad news for those of us who adore sweets. And that thing about girls being made of sugar and spice and everything nice has some truth to it. At least the sugar part. I think women get the gene marker for “I love sweets” far more often than men do. Wouldn’t you agree? I like to do a mild cleanse every spring and fall and eliminating sugar is part of that process (over and over again). I spent several weeks this summer backpacking a big chunk of the Colorado Trail and out of necessity my wilderness diet included a lot of fast-acting carbs in the form of gels, bars, and powdered drinks. (For more information about sport-specific nutrition, check out my fuel for performance post.) Because I’ve spent so much time lately eating sugar directly from the gel packet, I definitely feel the need to get myself back into balance. Nutrition needs change depending on the intensity of the activity and sometimes quick energy in the form of simple sugar is just what your cells are screaming for. But if you’re not running a marathon or climbing a 14,000 foot peak, there are better ways to balance your nutrition needs. Here are the sugar basics. Dietary carbohydrates include simple carbohydrates (sugars) and complex carbohydrates (starches and fibers). Simple carbs are monosaccharides (single sugars) and disaccharides (sugars made up of pairs of monosaccharides). Glucose, fructose, and galactose make up the single sugar units. Complex carbohydrates are composed of chains of monosaccharides called polysaccharides. It’s all a matter of linking chemical units, but if you see “ose” on the end of the word, it usually means sugar — at least in chemistry talk. Glucose is commonly called blood sugar. It’s what your body uses for energy. Fructose is the sweetest of all sugars and occurs naturally in fruit, some root vegetables, and honey. Lactose is a disaccharide made from the combination of galactose and glucose. It’s the sugar in milk. Sucrose is fructose and glucose linked together, also making it a disaccharide. Commonly known as table sugar, beet sugar, or cane sugar. It occurs in many fruits and some vegetables and grains. Maltose* is a disaccharide that consists of two glucose units. It is sometimes called malt sugar and is produced when starch breaks down. White table sugar is the common, highly-refined form of commercial simple sugar and usually comes from sugar cane or sugar beets. Confectioners sugar (powedered sugar) is common white sugar that has been crushed into a fine powder and is used in frostings and cake decorations. Unrefined dehydrated cane juice is the result of extracting and then dehydrating sugar cane juice. Because it undergoes far less processing that refined white sugar it retains some of the nutrients from the sugar cane plant. It’s a good source of riboflavin. Brown sugar (unrefined or raw) is a lightly purified and crystallized form of evaporated cane juice. The brown color comes from residual molasses. The “natural” version of brown sugar comes in varieties such as demerara, turbinado, and dark muscovado. Honey is made up of carbohydrates (simple sugar) and water. Your body uses honey in much the same way it uses table sugar, as a source of energy. The nice thing about honey, unlike refined white sugar, is it also contains some vitamins and minerals such as niacin, riboflavin, pantothenic acid, calcium, copper, iron, magnesium, manganese, phosphorus, potassium and zinc. Honey also has some antioxidant properties, the darker the honey, the higher the antioxidant content. Another benefit of using honey as a sweetener is the wonderful variety of flavors, depending on where the bees hang out. Stevia is a South American shrub whose leaves are used as a natural sweetener. It is sold as a dietary supplement that provides sweetness without the calories. Some people (like my mom) find the taste bitter. Molasses is produced during the sugar refining process, which takes several steps. It is the remaining syrup after the sucrose has been crystallized from sugar cane juice. Light molasses is from the first boiling of the cane, dark molasses from the second, and blackstrap molasses from the third. Molasses (especially blackstrap) is rich in iron, calcium, copper, and manganese. Unsulfered molasses is the best choice. Brown rice syrup is made from an enzymatic process in which the starch in the rice is broken down and the liquid is strained off and cooked to the desired syrupy thickness. Date sugar is made from dehydrated dates that have been ground into granules. Dates contain iron, potassium, and folic acid. Fruit juice concentrates are most often derived from white grapes, pears, peaches, or apples. It is usually highly refined and doesn’t contain the nutrients from the original fruit. High fructose corn syrup (HFCS) is a very highly refined form of genetically modified (most likely) white cornstarch. As the name implies there is a much higher ratio of fructose to glucose. Not only is the corn genetically modified, research indicates the ratios may be unhealthy, especially in growing children. It is best to avoid products containing HFCS. Sugar alcohols (aka sugar replacers) are sugarlike compounds that are absorbed more slowly than other sugars and are metabolized differently by the human body. They are incompletely digested and inefficiently absorbed from the small intestine into the blood stream making them an ingredient choice in low-carb and diabetic foods (they have less impact on blood sugar levels). But, because they are not properly broken down, they can cause intestinal distress (gas, bloating, diarrhea). Yuk! Examples of sugar alcohols are maltitol, mannitol, sorbitol, xylitol, isomalt, and lactitiol. Artificial sweeteners are sugar substitutes of varying chemical structures that provide negligible, if any, energy. Examples are Splenda, NutraSweet, Equal, and Sugaree. They offer sweetness with far fewer calories than regular sugar. Are they safe? Because they are artificial, I believe they should be avoided. Artificial ingredients and chemical additives don’t constitute real food and may cause health problems we aren’t even aware of. Most products that contain artificial sweeteners also contain other unhealthy ingredients. * The term malt is a continual subject of debate when it comes to gluten-free food sources. Malt is often derived from barley, which is a gluten-containing grain, so malt flavoring, malted milk, and malt vinegar most likely contain gluten. However, maltodextrin, which is the most common constituent in many “power” gels, is usually made from a gluten-free starch (rice or corn) if processed in the U.S. That may be a different story if your source is from outside the U.S. Many European manufacturers use wheat maltodextrin, so be sure to do your research if you are using imported products. If wheat is used as an ingredient in the U.S. the FDA requires it to be listed on the label. If you’d like a book with practical answers to these types of questions, Suzanne Bowland has a great one called The Living Gluten-Free Answer Book. 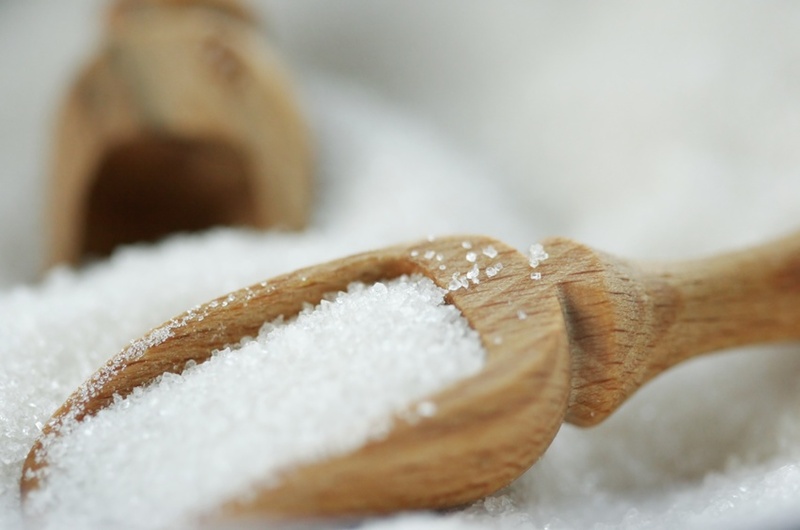 Now that you have a glossary of terms to refer to, let’s touch on some not-so-sweet facts about the American obsession with sugar. According to USDA data, in 1967 Americans consumed about 114 pounds of sugar per capita. By 2003 we were up to 142 pounds per person per year and I would guess it’s even higher today. I tried to get the current data on per capita consumption of all sugar sources, but it was difficult to figure out and I wasn’t confident my information was correct. But suffice to say, in the past 40 years or so, our average caloric intake of sweeteners per capita has spiked to what is now about 25 to 30 percent of our total calories per day. Soft drink consumption has increased dramatically as well. If you want to sift through the USDA data, check this link and refer to Tables 49 through 53. Whatever the final numbers add up to, the bottom line is we eat way too much sugar and drink way too much soda pop. Imagine taking a sugar bowl, sitting down with the newspaper or a magazine, and eating 33 teaspoons of refined white sugar each morning. That’s approximately how much we’re consuming per person per day. Ugh! One teaspoon of sugar contains about 16 calories. If 25% of our daily caloric intake is from sugar, that ends up to be about 33 teaspoons per day. No wonder our health is declining and our kids are getting fatter. One article I read mentioned the increased consumption of full-sugar soda pop for breakfast. Children are eating sugar-laced cereals and soda pop for breakfast! Then heading off to school. And people wonder why they can’t focus on their school work. Not to mention what this does to physiological development (brain and organ function, growing bones, etc.). Rather than continue a long-running narrative on sweets, I’ll simply list some of the reasons chronic over-indulgence of sugar negatively impacts health. • Carbohydrate malabsorption is common in people with untreated celiac disease and other digestive disorders (Crohn’s disease, IBS, etc.). The inability to break down (split in two) disaccharides (lactose, sucrose, maltose) causes them to remain in the digestive tract resulting in fermentation and bacterial imbalance. Symptoms include intestinal discomfort and ongoing inflammation of the small intestine. • Can interfere with nutrient absorption. • Can increase triglycerides, total cholesterol, and LDL levels and decrease HDL levels. • Contributes to obesity and diabetes. • Can cause behavioral changes in children. • Promotes systemic inflammation (arthritis, asthma, joint pain, ect.). • Upsets mineral balances in the body. • Causes mood changes and fluctuations in energy levels. • Promotes tooth decay and saliva acidity. • Contributes to candida/yeast overgrowth. • May contribute to osteoporosis. • Can cause hormonal imbalances. • Can exacerbate PMS and menopause symptoms. • Can contribute to food sensitivities. • Studies show a connection between high sugar intake and depression, mood disorders, and sleeplessness. I could go on regarding all the negative conditions associated with sugar, but you get the picture. Now, back to my starting point. Sugar isn’t inherently evil. In fact, it’s a delightful addition to our abundance of resources for cooking, baking, and enjoying food. But a little goes a long way and like most things in life, it’s all about finding balance. It’s called the fine art of moderation. Cutting back or eliminating sugar from the diet isn’t an easy thing to do and can cause some pretty nasty detox symptoms. All forms of sugar react in the body in similar ways, but some forms are better than others. And some are worse than others (HFCS). I find the easiest way to “look” at this is by first evaluating what you put in your shopping cart. NUMBER ONE — EAT REAL FOOD. Shop the periphery of the grocery store. Stick with fresh produce, fish, lean meats, eggs, and healthy dairy choices (if you eat dairy). Choose organic if possible. Skip the processed and packaged foods as most contain too much sugar, HFCS, and fat. Instead of drinking the juice, have the real thing (an apple rather than a glass of apple juice). 2. Eliminate all soda pop, both full-sugar and diet versions. 3. Use raw honey, molasses, or pure maple syrup as a sweetener rather than refined white sugar. Those healthier “alternatives” contain vitamins and minerals that are stripped from processed white sugar. 4. If you have a sugar bowl on the table, get rid of it. Don’t add sugar to foods — example: don’t put sugar on grapefruit or in tea. Eat the grapefruit plain and lightly sweeten the tea with honey. 5. Try using alternative sweeteners in your baking. I use maple syrup when I make granola; applesauce, baby food prunes, and unsweetened jam in baked goods; and pureed dates and crystalized ginger in my “power” bars. Most of us need to cut back on sugar — and fall is a great time to get started on renewed health and well-being. It’s a good time for change. If you have any tips or suggestions on how to live a low-sugar life, please share them. We can all use encouragement to eat healthier! Oh, and don’t forget to brush your teeth. This entry was posted on Wednesday, September 17th, 2008 at 12:52 pm	and is filed under Artful Aging, Celiac & Gluten Intolerance, Nutrition Therapy. You can follow any responses to this entry through the RSS 2.0 feed. You can leave a response, or trackback from your own site. Melissa, you are amazing and the world should feel lucky to have your blog! Thank you so much for writing all of this! And I have to admit; today is my birthday and this post feels kind of like a birthday present… I need to work on my sugar intake and this in the exact information I need to get that started. Excellent post, thank you!!! I really needed to hear this, I’ve been loading up on sugar lately and I do have Crohn’s disease and I know it’s NOT GOOD for me! Thanks, Lizzie, but the world definitely doesn’t need my blog! However, it’s a good way to share information and connect with this wonderful little (big?) subculture of gluten-free bloggers. Plus, your request for a sugar post got me motivated to start my fall cleanse. Glad you can’t hear me singing that. I love the new collection of Henry photos! Hi Jenny — yes, for those of us with celiac or Crohn’s, over-indulging in sugar is NOT a good thing. For anyone actually, but especially so for people with digestive issues. Sigh…I hate when you tell me things I already know but don’t want to know. Confessed sweet tooth here, although I have gotten a lot better. I hardly ever bake, I don’t add sugar to my food but I am powerless against small, red gummy-like candies. I currently have a ‘bad tongue’ and I think my sugar intake could be part of the reason for it. Darn you and your knowledge! I’ll be awaiting your post on a moderate cleanse because I think I need one. Just found your blog recently from GF Steve’s site. I love your focus on health and I am totally with you on eating real food. BUT I am still struggling with eating too much sugar, so coming here today to find this post is a very good thing. I have been GF for 5 years. About a month after going GF, I also went sugar free, dairy free, and gave up a few other foods that I tested senstive to. I did that for 6 months and then slowly reintroduced foods back in. However, I really want to give up the sugar and most dairy again, because I felt so great during that 6-month period. I lost 33 lbs, my skin looked wonderful, I had so much energy, etc. Frankly, I think giving up sugar is 100 times harder than giving up gluten. I know I went through a far worse detox for sugar than gluten, which just showed me how much it had affected me also. Every day I say to myself, okay, today is the day you are giving up sugar, etc. and returning to healthy eating … and then I don’t do it. If I can just get through a couple of days of no sugar, I can do it. Thanks again for the great, encouraging post! Megan — I know how good I feel (like Shirley mentioned) when I eliminate sugar from my diet. It’s amazing, but I have a hard time sticking to it for any length of time, so a spring and fall cleanse gets me back on track. As hard as it may be, it’s really worth doing. The “tongue” thing is most likely a candida/yeast issue, which is from sugar. Damn those little red gummy things! Watch out, with Halloween around the corner, you’re going to have lots of little red gummy spiders and skulls tempting you. Shirley — I know exactly what you mean. Exactly! It’s amazing how your overall health improves when you get rid of sugar. I also agree that giving up sugar is harder than giving up gluten. Much harder! Partly because we actually get addicted to it in a way. But, like you said, after 2 or 3 days, it’s not that hard. But those first few days of detoxing aren’t easy! Hang in there. Melissa, I love your blog! I have been following it for about a year, and I am always excited when I see a new entry. I have been gluten free for about a year and a half, and diary free for about 2 months. The last time I gave up sugar (during the detox and food sensitivity testing that lead me to gluten free), my whole body hurt during the detox. Something about the toxins being released my naturopath said?? It was bad! But I felt incredible afterwards. I think it’s time that I eliminate sugar once again, and continue my journey towards good health. Thanks again for the inspiration and motivation that comes from your blog! This is really interesting (and shocking! yikes! ), especially because I’ve always wondered about all the different types of sweeteners like brown rice syrup and agave nectar. I’ve always wanted to do a cleanse (key word: mild!) too. Your blog is so informative, Melissa, it’s so great to know there is someone out there I can turn to for information like this!! Beth — thanks! And you’re right about the detox process. You feel like poo for a few days, but once you get over the hump, it’s amazing how wonderful you can feel. And good for you for continuing your journey to better health. Yes, we have to revisit that time and time again. It’s not an easy process, but well worth the effort! Cindy — I LOVE the LHC physics post on your blog! I’ve watched it a couple of times. Makes me laugh, but it’s also educational. Yes, I’m not sure about the agave. I love the consistency and how easy it is to use for baking, etc., but the ratio is something I wonder about. Hmmm? Yes, stevia is incredibly sweet! Do you think it’s a touch bitter? Michelle — Glad you found this info useful! Yes, sitting in a lab for hours on end isn’t always conducive to healthy eating. I’ll touch base with you about your Heart of the Matter post! How nice of you to be committed to helping people eat heart-healthy foods! I used to be the biggest sugarholic until I read The Mood Cure by Julia Ross. It explains why certain foods, especially sugar, are bad for you and also suggests some suppliments that help to ease the cravings while you wean yourself off of it. I’ve been meaning to write about this. Hey Kelly — Thanks for the book info. There are several interesting books that address how sugar impacts your moods, your energy levels, your self-esteem, your overall health. Sugar Blues and Potatoes Not Prozac are two others. You are just a wealth of knowledge! Hey Tiffany — did you notice that I paid tribute to you in this post? Or were you too caught up in those nasty sugar stats? Speaking of sugar stats, after I wrote this post I found a resource that said that Americans eat 150 pounds of sugar per person, per year. Yikes, can you believe that! Ugh! Thanks for all the useful information. Your insight is very keen. Keep it up. Thanks for a great post about sugar. I use maple syrup as much as possible, and coconut sugar when I need it. What are your thoughts on coconut sugar? Would love to hear them! Thanks! Although I think coconut sugar is a good choice, I think I got zapped by it once, so I don’t use it anymore. I called the company (can’t remember now which product I used) and they said they can’t guarantee it to be gluten-free as they use the same processing equipment that is used for wheat-based products. So, in light of that, I’ve avoided it. If I find one that is certified GF, I’ll definitely use it. And if you don’t need to worry about contamination, I’d say it’s a fine alternative. Sucralose is an artificial sweetener. It’s the key sweetening ingredient in Splenda and it’s not absorbed by the body, hence it’s zero calorie status. It’s also way sweeter than sucrose (regular table sugar). I’m not fond of artificial sweeteners and would prefer sticking to more natural sweeteners like honey or maple syrup. You might want to try stevia for a low calorie sweetener.